Two Thousand and Eighteen has been a record year for rainfall in the Delaware Valley Region. With average rainfall typically at 45 inches, we are currently nearing 80 inches plus this year alone! This crushes the previous record since the initiation of rainfall records back to 1895. Due to the excessive rainfall you may have noticed your sump pumps running more, soft spots in lawns that were not there before, or water problems in the yard that have gotten worse with the record rainfall. DiSabatino Landscaping specializes in finding the appropriate drainage solution for your home. Instead of guessing and doing the bare minimum to remediate the symptom we take the time to actually assess and correct these issues for both your basement and landscaping. During our consultation, we weigh not only the history of the area but also what you, as the homeowner, have experienced during your time in the home. Whether you just built your home or your home has been in the family for generations; we have seen it all! All of our designers are equipped with state of the art leveling devices so we can find the correct solution for your home’s specific situation. This is the most cost effective solution for many homes. With this solution your landscape needs to have a minimum of a 2% grade to have the water properly flow over your lawn to the appropriate storm water management location. This type of work is typically done in swale creation. This is one of the most common culprits to having water sitting at the foundation of your home. By taking the downspouts out a minimum of 10’ from your home this can alleviate the rainwater load at the foundation of your house by almost 80%. We always run your downspouts with SCH 40 PVC pipe to ensure no sediment will be caught, crushing of the pipe will not occur from typical lawn traffic and we install the pipes with an easy cleanout system if you have leaves in your gutters. This is a more extreme case of surface flow drainage solutions. Typically, a dry riverbed solution is used in areas where grass will not easily grow. By creating the same surface flow solution as previously mentioned; however, we would install decorative or ballast stone that will allow the water to drain directly through the area to the appropriate storm water management location. Here we begin to get more in depth with your landscape. Catch basins/drain boxes are typically used when a low point in one point of your lawn does not drain properly and a surface flow or down spout solution is not the correct way to move the water away from your home. Here we install the appropriate sized catch basin to support the intake volume of water and move said water through the appropriately sized PVC SCH 40 pipe. This solution is used when water cannot be moved away from where the water is pooling. Typically used in smaller areas to move water from the surface into the soil column this solution begins to get into the more complex drainage solutions. Used in extreme solutions when water cannot be moved away from the location of pooling water in your yard; these solutions can hold and/or move the water underground to be dispersed into the soil column. This is one of the more costly installations of drainage solutions typically used on new homes or new hardscaping project needs. These ponds are designed to take excessive amounts of water from the surface and drain or collect them as needed by the county/township. 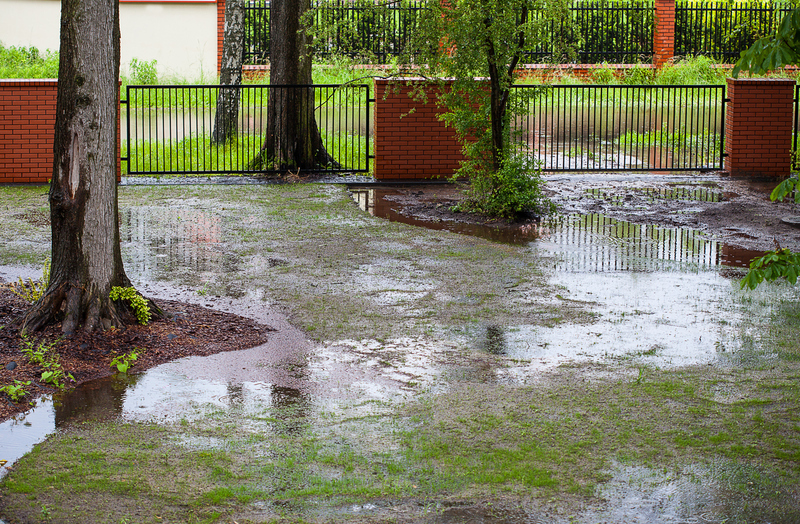 Please note that this is not a full list of solutions that DiSabatino Landscaping uses to alleviate poor drainage areas. However, if you have a wet spot in your lawn or an area you are worried about please give us a call and one of our designers will find the right solution for you! If you’re interested in talking with one our drainage experts regarding a custom assessment of your landscaping drainage system, call us at 302-764-0408 – email us at reception@disabatinoinc.com or fill out the form on our grading & drainage page. Posted in drainage, drainage fixes, grading & drainage and tagged Drainage Fixes to Protect Your Home and Landscaping, grading & drainage on October 10, 2018 by Denise Bernstein.